First off, Happy Passover to anyone who is celebrating! If you’re looking for any good Passover-friendly recipes, be sure to check out Ricki’s recipe round-up (her delicious ideas range from almond-feta cheese spread to caramelized onion “quiche” to crimson mousse–yum!). Also, check out Sally’s Sweet Freedom giveaway to win a copy of Ricki’s fantastic book! As for me, I’m neither Jewish nor religious in any context, so I’ve decided to whip out some fresh baked bread since leavening isn’t an issue. 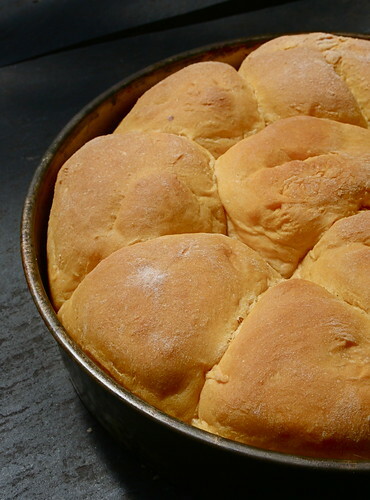 It’s been awhile since I posted a bread recipe, and while I’ve been cutting back on my carb intake while training for the triathlon, sometimes you just need a good dinner roll or slice of bread. Since I’m still wallowing in sweet potatoes from last fall (the last of the local produce until I can procure some in late April, early May), I’ve been using them up in everything from sweet potato mash to sweet potato fries to sweet potato bread. The latest, the dinner rolls, are definitely a winner. Beyond lending a marvelous spring-like color to the rolls, the sweet potatoes lighten the dough, resulting in a fluffy, chewy roll. While I didn’t add any whole wheat or other whole grain flour to the rolls, I think you certainly could, replacing the AP flour with 1/2 or 1/3 of a whole grain flour. And these rolls make the perfect base for the recipe I’ll share on Thursday–a new veggie burger! In a medium pot, boil the sweet potatoes in water until tender (approx. 20-25 minutes). Drain the water and mash. Set aside to cool (I put mine in the fridge for 20 minutes). Meanwhile, in a liquid measuring cup, add the salt, sugar, and yeast to the warm water, stir, and allow the yeast to proof for 10 minutes until foamy. In the bowl of an electric mixer (or in a large bowl, if making by hand), mix the sweet potato mash with the proofed yeast and water. Using the paddle attachment, slowly add flour one cup at a time (you may need more than 4-5 c, it just depends on the stickiness of the dough), until a ball forms. At this point switch to the dough hook (or place the dough on the counter to knead). Continue to add flour and knead the dough for 7-10 minutes, until the dough no longer sticks to the bottom or sides of the bowl. (If kneading by hand, do so for 10 minutes while adding flour to decrease the stickiness. When it’s pliable and not super sticky, it’s done). Place the dough in an oiled bowl covered with a cloth/plastic wrap in a warm place and let rise for 1 1/2-2 hours, until doubled in size. Punch down the dough and form into rolls. I made mine in cake pans, but you can place them separately on a baking sheet. Cover again and let rise in a warm spot for 30 minutes. Place the rolls in the oven and let bake for 10 minutes. After 10 minutes, reduce the heat to 375 degrees F and let bake for another 10-15 minutes, until the rolls are golden on top and sound hollow when tapped. Makes 15-16 medium sized rolls. These look great! I love the idea of sweet potato in my rolls! Brilliant! I’ve made potato rolls, but never sweet potato. I’m definitely going to have to try it! Oooh those look amazing! I’ve never made rolls before. Those sound yummy. I never thought to use sweet potatoes in a yeast bread before. I’ve been trying to make more yeast breads lately, I’ll have to try this one! Wow, these look like they have a really amazing texture! Such gorgeous rolls! (I was going to say, “buns,” but the pun made me stop!). I adore sweet potatoes in anything–bet this would be a bread I could love! Hope you have a great long weekend, however you spend it! Hey! This seemed like a really good idea, but I didn’t want to use up our sweet potatoes, so used carrots instead (they’d gotten frozen – silly refrigerator). Will blog it later, but thanks for the idea! I used 1 cup all purpose 1 cup wholewheat and 2 cups rye flour, it made a lovely denser rustic roll. We used the rolls with delicious vegan sweet potato and quinoa patties. It was delicious!